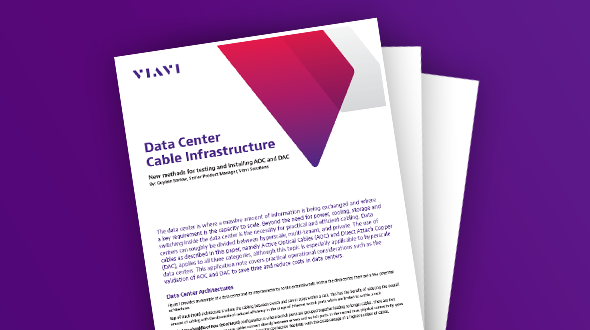 Hyperscale Data Centers, Cloud, Internet Content Providers (ICP), and Data Center Interconnect (DCI) | VIAVI Solutions Inc. This ebook examines the issues facing data centers, the technologies promising to address them, and the role of test and measurement in assuring lightning-fast performance. VIAVI Solutions partners with hyperscale data center operators, internet content providers (ICPs), cloud service providers and those deploying robust data center interconnects (DCI) to reduce testing time, optimize optical networks, reduce latency and ensure 100% reliability that supports SLAs. We guarantee performance of optical hardware from labs to turn-up to monitoring, including equipment that can inspect MPO connectors in 12 seconds as well as equipment that can test two 100G ports simultaneously. Because VIAVI Solutions is involved in all stages of hyperscale optical testing, we understand how you’re building high speed networks up to 400G and beyond – and we have the equipment to test it all. VIAVI Solutions is an active participant in over thirty standards bodies and open source initiatives including the Telecom Infra Project (TIP). But when standards don’t move quickly enough, we anticipate and develop equipment to test evolving standards. We believe in open APIs, so hyperscale companies can write their own automation code. VIAVI Solutions has been testing communications equipment for nearly 100 years. New methods for testing and installing AOC and DAC. Save a lot of test time with the industry’s fastest and most complete portfolio of test solutions for MPO connectivity. Learn why anyone installing fiber should inspect before they connect – using VIAVI award-winning fiber test solutions. There are thousands of potential points of attachment for test instruments in some data center environments. Learn key test use cases for data center operators. Binge on a series of VIAVI-hosted webinars that review environments, challenges, and tests related to the data center. Next-generation networks are not just about bigger pipes; you need intelligence, flexibility, and scalable capacity. Learn why the best way to see if 16 QAM modulations are working efficiently is to test the DCI connection. Disaggregation of the optical network is different than the data center; learn about the challenges. Learn how AOC/DAC/breakout cables can be easily tested using the VIAVI T-BERD/MTS 5800-100G test set.